This is the 208th edition of the Epileptic Gibbon podcast music show and the playlist to accompany it. You may be able to CLICK HERE TO LISTEN but note the shows are large files & this may not be the best way to listen. If you prefer, you can subscribe to the show via iTunes by sticking feeds2.feedburner.com/TheEpilepticGibbonPodcastMusicShow into the ‘Subscribe to podcast’ area & then you’ll get the new shows as they become available. The show is also available to stream via Mixcloud and the Progzilla Radio Network (the show appears on Progzilla in alternate weeks). 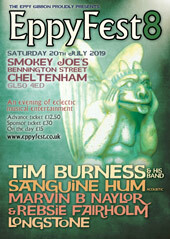 Thanks to Daniel Staniforth and Rebsie Fairholm for filling in for me in fine style on the last show, but I’m back this time to preview my own upcoming live music event EppyFest Mini, happening in Cheltenham on Saturday 29th July. We also have a feature album, which this time has an EppyFest connection as it’s ‘Irritant’, the brand new album by Schnauser who are headlining EppyFest Mini. We’ll also cover the usual diverse selection of styles and genres, as we feature music from the other four bands/acts on at EppyFest Mini, play tracks from some new releases, & pay tribute to a couple of people who have left this mortal coil in the past month. Below you’ll find the track list, plus weblinks from where you can find more information about each artist. Total running time: 1 hour & 58 minutes. Downloaded file is 108.2 MB. Thanks to all the musicians who contributed and to all listeners. Send us comments if you like what you hear (or even if you don’t… feedback is so important!). If you want to keep up to date with news about the show, EppyFest, or just chat with other listeners, don’t forget that there’s a Facebook group – just search for the Eppy Gibbon Podcast Show on Facebook and request to join, plus don’t forget that we’re now part of the Progzilla Radio Network. Eppy should be back again next time with his half-term report of the musical year of 2017, so we hope you’ll be back to listen to that show. This is the 185th edition of the Epileptic Gibbon podcast music show and the playlist to accompany it. CLICK HERE TO LISTEN. The show is also available via Mixcloud HERE and the Progzilla Radio Network (the show is now appearing on Progzilla in alternate weeks). Many thanks to Daniel & Rebsie of Alchymical Muse for kindly sitting in for me and producing such a fabulous show last time, but now that EppyFest is over for another year, it’s me back in the saddle again. And I return with a half-term report; a show filled with some of the best music released in the first six to seven months of 2016. There’s no feature album this time, but you can expect the usual diverse selection of styles and genres, it’s just that all the music is taken from the first half of 2016. Below you’ll find the track list, plus weblinks from where you can find more information about each artist. Total running time: 2 hours & 38 minutes. Downloaded file is 144.3 MB. Thanks to all the musicians who contributed and to all listeners. Send us comments if you like what you hear (or even if you don’t… feedback is so important!). If you want to keep up to date with news about the show, EppyFest, or just chat with other listeners, don’t forget that there’s a Facebook group – just search for the Eppy Gibbon Podcast Show on Facebook and request to join, plus don’t forget that we’re now part of the Progzilla Radio Network. I should be back for the next show, hopefully with yet another of my reviews of some of the best music that came out last year (yes, I am still doing my review of 2015), so I hope you’ll join me for the next edition of the show. This is the 183rd edition of the Epileptic Gibbon podcast music show and the playlist to accompany it. CLICK HERE TO LISTEN. The show is also available via Mixcloud here and the Progzilla Radio Network (the show is now appearing on Progzilla in alternate weeks). On this show I’ll be featuring nothing but music from bands, acts & artists we’ve never played on the show before. This includes some new bands/acts, some classic bands/acts, & some that have been around for a while but I just haven’t got into them or played them before now. As part of this our feature album is ‘Singles’, the original soundtrack album for the film of the same name, and therefore you’ll hear three tracks from that. Otherwise you can expect the usual diverse selection of styles and genres, with some tracks dedicated to or inspired by friends and listeners, & the rest coming entirely from me. Below you’ll find the track list, plus weblinks from where you can find more information about each artist. Total running time: 2 hours & 34 minutes. Downloaded file is 141.25 MB. Thanks to all the musicians who contributed and to all listeners. Send us comments if you like what you hear (or even if you don’t… feedback is so important!). If you want to keep up to date with news about the show, EppyFest, or just chat with other listeners, don’t forget that there’s a Facebook group – just search for the Eppy Gibbon Podcast Show on Facebook and request to join, plus don’t forget that we’re now part of the Progzilla Radio Network. I’ll be busy building up to EppyFest over the next few weeks, so next time Daniel & Rebsie will be back yet again with their own wonderful take on the Eppy Gibbon show, and I’ll be back for the show after that with my half-term report of the musical year of 2016. I hope you’ll come back for those shows.